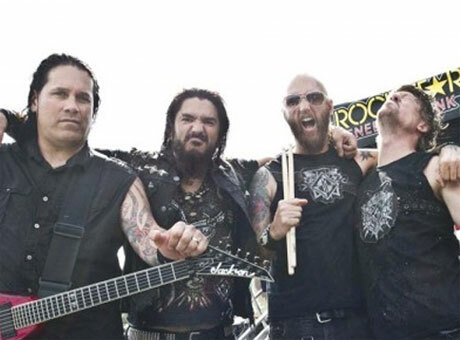 Oakland metal mainstays Machine Head have yet to properly follow up their crushing 2011 long-player Unto the Locust, but fans just may get to hear some new tunes from Robb Flynn and co. this fall when they thrash into their next North American tour. The Bay Area band will act as the headliners on a four-band bill that will see them joined by Finnish crew Children of Bodom, Michigan's Battlecross and Dutch symphonic metal unit Epica. The month-long trek primarily concentrates on the U.S. theatre circuit, but there are Canadian concerts lined up in Toronto, Montreal, Vancouver, Edmonton and Saskatoon. There are also a few shows that will only feature Children of Bodom and Battlecross, including dates in Calgary and Winnipeg. You'll find all of the show details down below. "I am stoked that we were able to join up with our friends in Children of Bodom, one of the premier power metal bands of our time, and our friends in Battlecross, who we toured with on Mayhem last year, and are going to bring the old-school thrash vibe," Flynn commented in a statement. "Epica's symphonic metal will add a touch of much-needed class to the drunken shenanigans that will surely take place on this raucous tour."